For semiconductor investors, reducing exposure to the memory-chip market with names like Intel and Samsung might be the best strategy. 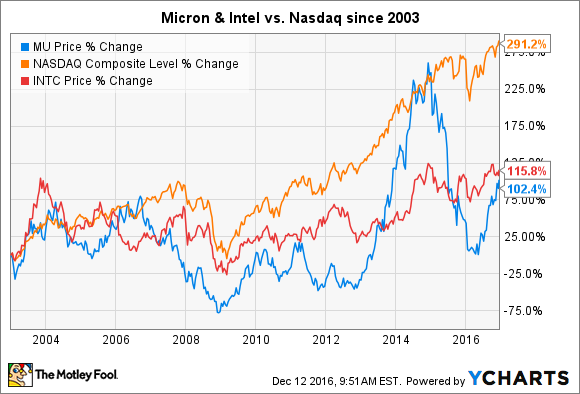 While more diversified semiconductor producers like Intel (NASDAQ:INTC) have also underperformed the tech-heavy Nasdaq, Micron shares have performed slightly worse than Intel while also proving far more volatile in the process. This boom-and-bust tendency in Micron stock makes it highly unappealing from a long-term investor's perspective. So here are two other semiconductor names investors could do well to consider in lieu of Micron. Though they share a common industry, Intel's and Micron's respective places within the semiconductor market give them little else in common. Intel dominates the market for PC and server microprocessors, the chips that serve as the "brains" for PCs and servers. In these markets, speed matters, and Intel's ability to consistently produce the fastest chips has allowed it to command premium prices for its chips. Over time, Intel's cushy margin structure allowed it to reinvest heavily in research-and-development and manufacturing innovations, thus extending its chips' competitive position. This self-reinforcing cycle has lead Intel to enjoy what many view as a moderate competitive advantage over rivals like Advanced Micro Devices. The difference in quality between Intel's and Micron's segments of the semiconductor market truly shines through when you compare their respective margin structures. For example, Intel's two core operating segments are each larger, more profitable, and more stable than Micron's entire revenue base, which relies almost exclusively on commodity-like memory chips. Moreover, Micron, which recently released its full-year fiscal 2016 earnings, generated $12.4 billion in sales this fiscal year. And though Intel will not release its FY 2016 report until early next year, Intel's 2015 operating profits topped $14 billion, more than Micron's entire sales this fiscal year. For this article's purposes, Intel's chief virtue is its lack of exposure to the low-margin memory-chip business. Unlike Intel, Korean conglomerate Samsung (NASDAQOTH:SSNLF) competes head-to-head against Micron in the memory-chip market to a meaningful degree. However, Samsung holds an advantage over Micron in that its memory business serves as a single piece of its many business segments, one that nicely complements its consumer-electronics businesses. Samsung's phones, tablets, wearables, and other devices require memory chips in order to store the code on which their software runs. Manufacturing its own memory, via its Samsung Foundry business, allows Samsung to reduce its reliance on third-party memory suppliers like Micron, while also lowering its component costs. Samsung's memory business is not just a profit center for the company, but also serves its overall strategy by allowing it to more effectively produce its electronics. Equally important, Samsung likely remains the market's largest memory-chip maker; Samsung not only builds its own chips, but also makes chips for third-party tech companies like. Especially in industries where the market sets prices, being the largest provider can provide some benefits over the competition. In that vein, Samsung's $29 billion in memory-chip sales in fiscal year 2015 more than doubled Micron's total sales this year. What's more, Samsung's massive Foundry business gives it the ability to more effectively compete for market share against stand-alone operators like Micron. However, I prefer Samsung (like Intel) over Micron for its diversification away from the memory-chip market, not its strong competitive stance within it. Each of the companies presented here was selected because it faces less exposure to the memory-chip business than Micron. As evidenced by Micron's performance this year, investors can profit immensely by investing in Micron under the right conditions. As in any commodity-esque business, though, times of weak pricing can cause wrenching losses for companies like Micron, which relies on memory-chip sales as its sole source of revenue. To be sure, Micron has done a nice job consolidating market share, which could help give it the ability to compete throughout the memory-chip price cycle. However, for long-term investors, plenty of other stocks in the semiconductor market offer less risk and more growth than Micron does today.